Viniculture in LI, Part II: background. In exploring vinicultural practices in Long Island, I intend to particularly examine the practice of sustainable farming, which includes organic and Biodynamic® agriculture. My original, first posting on 15 June 2010, Can 100% Organic Grapes be Grown in Long Island?, provoked some interesting and even useful responses. I have since renamed it The Challenge of Growing Certified Organic Grapes in Long Island, given the developments at Shinn Estate and The Farrm that have taken place since that 2010 posting. The series now continues with this posting (now updated to April 2015 to include new developments and information, particularly with the Long Island Sustainable Winegrowing [LISW] program established in 2012). This Part II post serves as an introduction to the Part III articles devoted to the individual vineyards and wineries of Long Island. To put things in perspective, one should bear in mind that New York State is the 3rd-largest producer of grapes by volume in the United States, after California and Washington. Admittedly, most NY vineyards grow table grapes, but as of 2014 there were, according to the NY Wine & Grape Foundation (NYWGF), 373 wineries in the State, of which of which one in six are in Long Island. Of all the wine regions of the State, Long Island is the one that is most committed to growing Vitis vinifera varieties, with very little planting of French-American hybrid vines and no Native American grapes at all. Geologically, Long Island is extensively formed by two glacial moraine spines, with a large, sandy outwash plain extending south to the Atlantic Ocean. These moraines consist largely of gravel and loose rock that would become part of the island’s soils during the two most recent extensions of Wisconsin glaciation during the Ice Age some 21,000 years ago (19,000 BCE). The northern, or Harbor Hill, moraine, directly runs along the North Shore of Long Island at points. The more southerly moraine, called the Ronkonkoma moraine, forms the “backbone” of Long Island; it runs primarily through the very center of Long Island. The land to the south of the Ronkonkoma, running to the South Shore, is the outwash plain of the last glacier. When the glaciers melted and receded northward around 11,000 BCE, their moraines and outwash produced the differences between the North Shore and the South Shore soils and beaches. 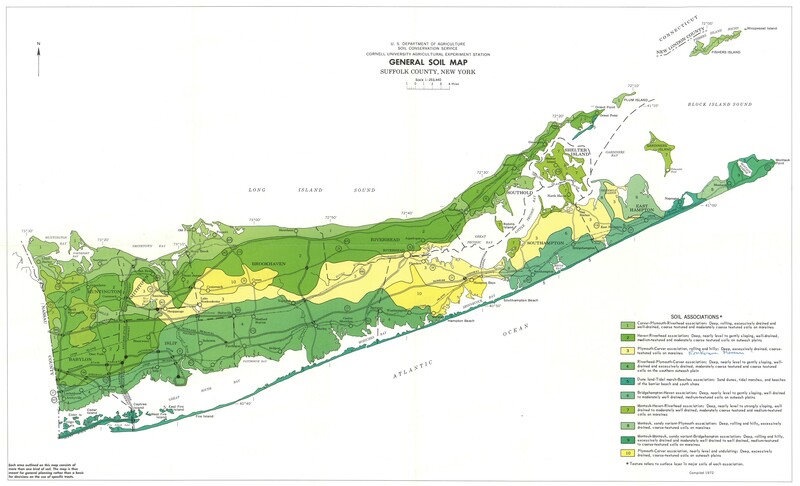 A General Soil Map (below), devised by the USDA Soil Conservation Service and the Cornell University Agricultural Experiment Station in 1972, shows the different kinds of soils that dominate the East End of Suffolk County, the part of Long Island that is home to most of the vineyards there. “Plymouth-Carver association [runs across the middle of the West-East axis of the county, encompassing Riverhead just south of 2. It then extends into the Hamptons or South Fork as far as East Hampton but at no point touches the south shore.] rolling and hilly: Deep, excessively-drained, coarse-textured soils on moraines [the Ronkonkoma Moraine]. The “useless” soil that splits is clay, a colloidal suspension of particles similar to Jell-O. Clay retains too much moisture when it rains, making the tender roots of wine grapevines rot; it withholds nutrients from the vine when the weather is dry. There is little clay on the East End of Long Island, except in specific and easily identified veins. We have remarkably uniform sandy soils here that vary in available topsoil (loamy organic matter), but all contain the same fundamental yet complex mixture of minerals. These soils are ranked by the U.S. Soils Conservation Service as “1-1,” the most auspicious rating for agriculture. Any single handful of Long Island soil will show the reflective glint of mica; the dull gray of granite; the mellow pink, salmon and white of quartz; the red and ochre of sandstone; and black bits of volcanic matter. To describe them simply as “sandy loam” fails to acknowledge the profound effect that having this mixture of minerals must have on the vibrancy and dynamic quality of Long Island’s wines. Richard Olsen-Harbich, the author of the two AVA applications for the Hamptons and the North Fork, published a two-part series on the soils of Long Island for Bedell Cellars, where he is winemaker: the first, The Soil of Long Island. Part 1 – Ice Age: The Meltdown, published on April 12, 2011, and the second, more recent piece, The Soil of Long Island. Part 2 – There’s No Place Like Loam, published Sept. 6, 2013, which are useful and lucid explanations of how the glaciers of the Ice Age left Long Island with the soils that grow the vines today. It should also be pointed out that Long Island soil, regardless of its composition, tends to have a rather low pH, which is to say too acidic for Vitis vinifera vines to grow well as it weakens the vines’ ability to assimilate nutrients from the soil. The vines need the addition of lime to balance the pH and is something that nearly every vineyard must do to get itself established for vinifera. It can take years—Paumanok Vineyards was adding lime to its vineyards every year for twenty years before it was able to relax the practice. It nevertheless has to be done again every few years when the pH gets too low again, as it appears that the added lime may get leached out of the soil over time. Despite being next door to each other, there are notable differences between the South Fork and the warmer North Fork. The South Fork is more exposed to onshore Atlantic breezes, delaying bud-break by as much as three weeks. Even after bud-break, the area is frequently foggy, keeping early season temperatures and sunshine hours lower than on the North Fork. By the end of the growing season, the seemingly subtle weather differences between the Forks add up to quite different overall climates. The Hamptons are generally very cold to moderately cool, while the North Fork is moderately cool to relatively warm. 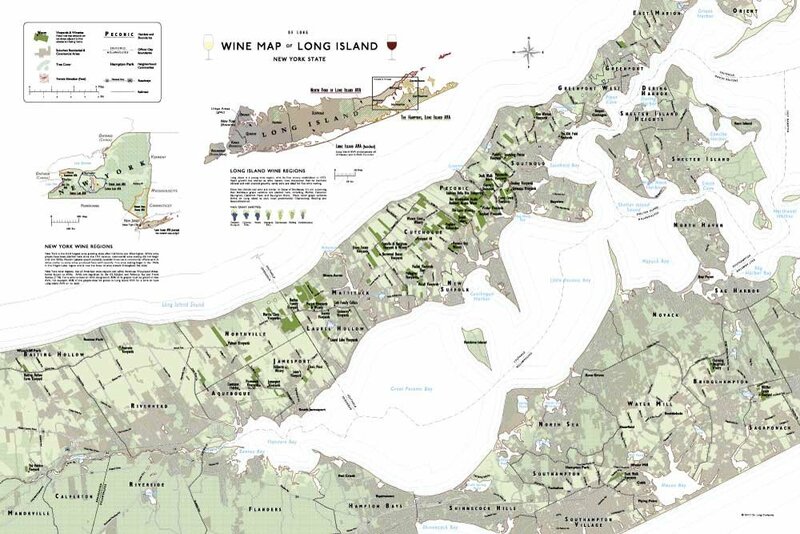 The damper silt and loam soils of The Hamptons, along with climactic differences, create a unique style, with wines from The Hamptons generally being more restrained and less fruit-forward than wines from the North Fork. Regardless of the different terroirs of either Fork, the first point that I’d like to make is that, based on my visits, so far–to Wölffer Estate and Channing Daughters in the Hamptons AVA, and to Bedell Cellars, Castello Borghese, Diliberty, Gramercy, Jamesport, Lieb, Lenz, Macari, Martha Clara, McCalls, Mudd Vineyard, The Old Field Vineyards, Osprey’s Dominion, Palmer, Paumanok, Peconic Bay, Raphael, Kontakosta Winery, Sherwood House, and Shinn Estate in the North Fork AVA–the standards of vineyard management are of a very high order. The neatness of the rows of vines, their careful pruning and training (most, if not all, are using Double Cordon trained on two wires with Vertical Shoot Positioning, or VSP, and cane pruning), the use of cover crops between rows, and much else besides, attest to the high standards and sustainable practices to which the vineyard managers aspire. A handful of vineyards are endeavoring to farm organically and/or Biodynamically, though only a single vineyard, Shinn Estate, is actually working to obtain actual certification for both. Then there is The Farrm, in Calverton, run by fruit and vegetable grower Rex Farr, who obtained full organic certification in 1990 and planted vinifera vines in 2005–thus harvesting the first certified-organic grapes on LI in 2012. It is expected that the first wine to be made from its fruit will be produced in 2013 by a newly-established winery on the North Fork. None of this is to say that a vineyard that does not seek to grow organic or Biodynamic grapes is the lesser for it, though all should seek to farm sustainably. Excellent, even great wines have been and shall continue to be produced whether farmed organically or not. Indeed, as I pointed out at the beginning of my first post, there is no proven correlation of quality of a wine because it is made with organic or Biodynamic grapes. (A case in point is the famous and incredibly expensive wine of the Domaine de la Romanée Conti, in Burgundy. It has been long acknowledged as the source of some of the greatest red and white wines of all of France, and this was the case before it was converted to Biodynamic farming, and continues to be the case today.) Part of what makes it so difficult to quantify the quality of a wine made by either method is that fact that there is vintage variation every year, due primarily to factors of weather and climate. Thus, there is no objective way of being sure that viticultural practice was the dominant reason for the quality of a particular vintage, rather than the weather of a particular season. Nevertheless, those who practice organic/Biodynamic viniculture do aver that it is reflected in the wine and there are consumers who do think that they can detect the difference. By now virtually all of the vineyards on the two forks are attempting some form of sustainable farming, though the kind of sustainable work can vary considerably across the gamut of over sixty vineyards. Along these lines, an important development took place when a new accreditation authority was created in May 2012: Long Island Sustainable Winegrowing, Inc., with the intent of setting out the guidelines for sustainable viticultural practices for all wineries in the region. Membership is voluntary, but already, as of April 2015, there are sixteen vineyards that have joined, with thirteen already certified and three in transition. Others are giving membership serious consideration. A post devoted to the LI Sustainable Winegrowing authority was published on this blog in April 2012 (since updated as of 21 June 2013). Over the past 10 years, grapevine clones have shown themselves to be of increasing importance in our vineyards. Simply put, clones are a genetic variant of a particular variety. The Chardonnay grown on Long Island decades ago is not the same vine we have today. Plantings since that time – especially in the past 10-15 years, have benefited from a wider selection of available plant material. Back in 1990, if you wanted to plant Chardonnay, you had one choice. Today there are more than 70 registered clones of this noble white grape being grown throughout the world and they all have their particular nuances and characteristics. Many of these clones are already in existence in Long Island vineyards – from the tropical and aromatic Musqué to the classic and alluring Dijon clones from Burgundy. Although these are all Chardonnays, each exhibits their own distinctive character. This fact is also true of grapes like Merlot and Cabernet Franc, where profound differences in wine quality can be seen between clones grown in the same vineyard, on the same soils. Over 50 clones of Merlot have been identified in Bordeaux. Pomerol alone has over 35 clones of Cabernet Franc. Newer French clones, long kept overseas as tightly held trade secrets, are finding their way into the United States. In most cases these new clones are better suited to our maritime climate. Often these clones will ripen earlier than the older selections we used to have. Some are more resistant to disease. The ultimate result is higher quality wines. I’ve seen clones so different from each other that you would think the wines were made from another variety entirely. In other words, when the first vinifera vines were planted in the 70s and 80s most of the clones came from California. Many of these clones had been developed at the University of California at Davis (UCD) but of course were created with California vineyards in mind. This meant that the clones were less suitable for the very different, maritime climate of Long Island. For example, the Sauvignon Blanc clone 1 (the ‘Wente clone’) was very vigorous and produced large clusters but it was also very susceptible to rot in LI. Only in the 90s were new clones planted to replace clone 1, and all of these came not from California but France (primarily from Bordeaux, in the case of the Sauvignon Blanc.) This process was true for several other varieties. In other words, the new clones are part of what makes Long Island the most ‘European’ of the wine-growing regions of the United States. In any event, the point of this series is to understand the reasons for choosing a particular approach to grape production over another. We want to understand why Long Island vineyards do what they do before we go on to explore their methods of vinification, for between what is done in the vineyard and what happens in the winery is what determines the quality of the wine that is produced. The wines from Long Island have long been improving since those first, tentative years going back to 1973 (when the Hargraves planted the first vinifera vines in LI) and in recent years are receiving their due recognition in the form of positive reviews, awards, and high scores for individual bottlings. AVA or American Viticultural Area: An area defined by a unique geology and climate that is distinctive from other vine-growing areas and hence that produces wines of a distinctive overall character. There are none of the restrictions as to varieties planted, vine density, allowable harvest per acre, or any of the other limitations that exist in European appellations, such as the French Appellation d’Origine Contrôlée (AOC). Long Island has three AVAs, all applied for to the TTB (Alcohol and Tobacco Tax and Trade Bureau) which administers the program, in the mid-1980s: The Hamptons (South Fork), the North Fork AVA, and the Long Island AVA. Biodynamic®, or Demeter USA, certification; also, Demeter USA, FAQ, Biodynamic wine (PDF file). Also, see an excellent discussion in a 5-part series beginning with New York Cork Report, Biodynamics, Part I, by Tom Mansell, along with the ensuing debate in the comments that follow each of the postings. There is also a controversial series against Biodynamics by Stuart Smith, a winemaker in California, called Biodynamics is a Hoax, a polemic that is worth reading, along with the comments in response. Macroclimate: The climate of a large area or region, such as that of all of Long Island, or perhaps just the East End of LI. Mesoclimate: The distinct climate of a smaller area, such as that of a single vineyard or a parcel thereof. Stylet oil: defined in the industry as a Technical Grade White Mineral Oil, it is used as a biodegradable fungicide and insecticide in integrated pest management programs. It also serves as as a substitute for sulfur, reducing or eliminating the need for that application, according to Steve Mudd, a LI vineyard owner and consultant. Sustainable agriculture: according to Mary V. Gold, on the USDA Website, “Some terms defy definition. ‘Sustainable agriculture’ has become one of them. In such a quickly changing world, can anything be sustainable? What do we want to sustain? How can we implement such a nebulous goal? . . . If nothing else, the term ‘sustainable agriculture’ has provided talking points, a sense of direction, and an urgency, that has sparked much excitement and innovative thinking in the agricultural world.” Follow this interesting, full explanation of the term at USDA, Sustainable Agriculture definition. Another excellent source for information about sustainable agriculture is to be found on the NY State VineBalance Program website, which is dedicated to sustainable practices in NY State vineyards, and as mentioned above, the Long Island Sustainable Winegrowing certification program, with sixteen vineyards already committed to its regulations and guidelines. Variety vs. Varietal: not to be pedantic (though I can be), Variety is the term applied to a particular kind of vine and its grape; e.g., Cabernet Franc or Riesling; Varietal is the wine made from a variety or a blend of different varieties. The terms are often used interchangeably but shouldn’t be. Vertical Shoot Positioning: is a training system used with single or double Guyot, cane-pruned training, or with a Cordon, spur-pruned system. VSP is very common in cool and/or humid climate regions with low to moderate vigorous growth, as it encourages better air flow through the vine. This is accomplished by making all the shoots grow vertically, with no vegetative vine growth allowed below the cordon/cane. The increase in air flow helps prevent problems associated with disease and also allows the fruit to dry out more quickly after it rains. For a full explanation of VSP, see Cornell Univ. Agriculture Extension, Training, and Trellising Vinifera Vines. Viticulture vs. Viniculture: again my pedantic side will out–Viticulture is the general term for the growing of any kind of grape vine, whether intended for the table or for wine; Viniculture refers to the raising of wine grapes in particular. Corwith Vineyards, Hamptons AVA (3 acres; LISW sustainable-certified); Dave Corwith interviewed May 20, 2014 and Nov. 16, 2015; posted Oct. 15, 2014, updated Nov. 19, 2015. Duck Walk Vineyards, Hamptons AVA, and Duck Walk Vineyards North, North Fork AVA (130 acres; LISW candidate); Ed Lovaas, winemaker, on Nov. 16, 2015. to be posted. Jamesport Vineyards, North Fork AVA (60 acres); Ron Goerler, Jr. interviewed on April 14, 2014; posted Sept. 9, 2014. Pindar Vineyards, North Fork AVA (500 acres; LISW candidate); Pindar Damianos interviewed Sept. 26, Ed Lovaas on Nov. 16, 2015. to be posted. Whisper Vineyards, Long Island AVA (17 acres); interviewed Steve Gallagher on Mar. 27, 2015, to be posted. Three very useful links that serve as portals to most of these vineyards are 1) Long Island Wine Country which lists only those wineries and vineyards that are members of the LI Wine Council; 2) Uncork New York! (aka the New York Wine and Grape Foundation) which provides links to all wineries and wine vineyards in New York State. Also indispensable for New York State wines is the New York Cork Report by Lenn Thompson, with its many interviews, coverage of wine tastings, reviews, and more. This entry was posted in References, Vineyards, Viticulture, Wineries and tagged Acidic Soil, Ackerly Pond Vineyard, American Viticultural Area, Anthony Nappa Wines, AVA, Baiting Hollow Farm Vineyards, Bedell Cellars, Biodynamic Viticulture, Bordeaux mix, Cabernet clones, Castello di Borghese, Channing Daughters Winery, Chardonnay clones, Compost Tea, Cornell University Agricultural Extension, Corwith Vineyards, Demeter USA, Dijon clone, East End of Long Island, Glacial moraine, Hamptons AVA, Hamptons Wineries, Harbor Hill Moraine, Kontokosta Winery, Larry Perrine, Lenn Thompson, Lenz Winery, LI Sustainable Winegrowing, LI Wine Council, LISW, Long Island AVA, Long Island Sustainable Winegrowing, Long Island Vineyards, Long Island Wine Council, Long Island Wine Country, Louisa Hargrave, Louisa Thomas Hargrave, Macari Vineyards, McCall Vineyard, Merlot clones, Mudd Vineyard, New York Cork Report, New York Grape and Wine Foundation, North Fork AVA, North Fork Wineries, Old Field Vineyards, One Woman Vineyards, Organic Grapes, Organic viniculture, Organic Viticulture, Organic winegrowing, Organic Wines, Osprey's Dominion, Palmer Estate, Paumanok Vineyards, Peconic Bay Winery, Pellegrini Vineyards, Regalia, Revenge of the Clones, Richard Olsen-Harbich, Ronkonkoma Moraine, Sam McCullough, Sauvignon clones, Serenade pesticide, Sherwood House Vineyards, Shinn Estate, Soil of Long Island, South Fork AVA, Southold Farm + Cellar, Sparkling Pointe, Stuart Smith, Surrey Lane Vineyards, Sustainable Viticulture, The Farrm, Tom Mansell, Uncork New York!, Vertical Shoot Positioning, VineBalance, Vineyard terroir, Wente clone, Wolffer Estate on 26 October 2013 by JoseM-L.